Renault Samsung Motors Corp. has decided to idle its auto plant in Busan, South Korea for five days, raising concerns for the fate of the foreign-owned carmaker and the broader Korean auto industry that is battling waning productivity from high wage costs and frequent labor disputes. The South Korean unit of French automaker Renault S.A. announced it would shut down in its main Busan base from April 29 to May 3, counting in the national holiday on May 1. Workers at the Busan plant would be forced to take “premium leave,” which are days off given as part of company welfare in addition to the legal annual leave. The move is viewed as an attempt to save costs as the factory has been running at just 75 percent of its full capacity due to reduced demand at home and the phase-out of its mainstay Nissan Rogue model, a sport utility vehicle manufactured at the Busan plant for overseas shipment. 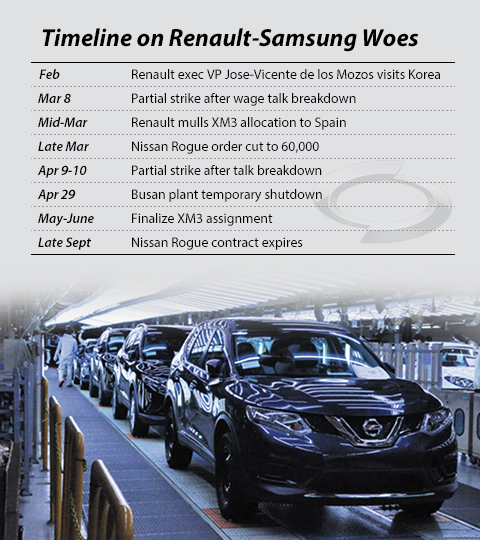 The Korean operation lost favor with its parent the Renault Alliance after its union pressed on with partial walkouts from October last year, dragging on wage negotiations throughout this year. Until last month, the union staged 50 walkouts for a total of 210 hours. The management estimated that the strikes in the first three months of this year caused disruption in the production of 4,800 units of the Nissan Rogue. Last month, Nissan notified Renault Samsung that it would slash its Rogue order to the Busan plant this year to 60,000 units, down 42,000 from 2018, ahead of the expiration of its contract in September. Renault Samsung said poor sales were largely to blame for the 18,000 cut and that the remaining 24,000 units were being assigned to Nissan’s Kyushu plant in Japan amid lingering disruption fears at Busan. Renault has already decided not to extend its contract for Rogue, which would deal a heavy blow to the Busan plant as the model accounts for nearly half of its total turnout. The parent company also threatened not to assign a replacement model after scrapping its plan to consign the all-new Rogue to the Korean unit. Renault Samsung is the largest company in the southern port city of Busan, with annual sales of 6.7 trillion won ($5.87 billion). It holds considerable sway in the regional economy as it represents more than one-fifth of the area’s total exports. It also commands an extensive network of auto part suppliers and partners, whose combined annual revenue totals 500 billion won. The company plans to restart negotiations with the union next week after their talks in March ended in an impasse. Workers have since backed down from their demands for higher wages but are now calling for reduced workload and 200 more new hires. The biggest sticking point is the union’s demand for consensus on decisions regarding the rearrangement of worker positions, which are currently reached through consultation. The management dismissed the proposal, saying there is no such precedent among global companies and that it runs the risk of undermining management rights and hurting productivity.